2015! It’s here, and it’s time to stock up on the essentials. You know, the products you can’t live without and for me, I have 5 from Lush I always make sure stay in my drawer. Lush have a fantastic product range and there are so many more products I can’t wait to try, but 5 have always stuck around over the years that I never get tired of. 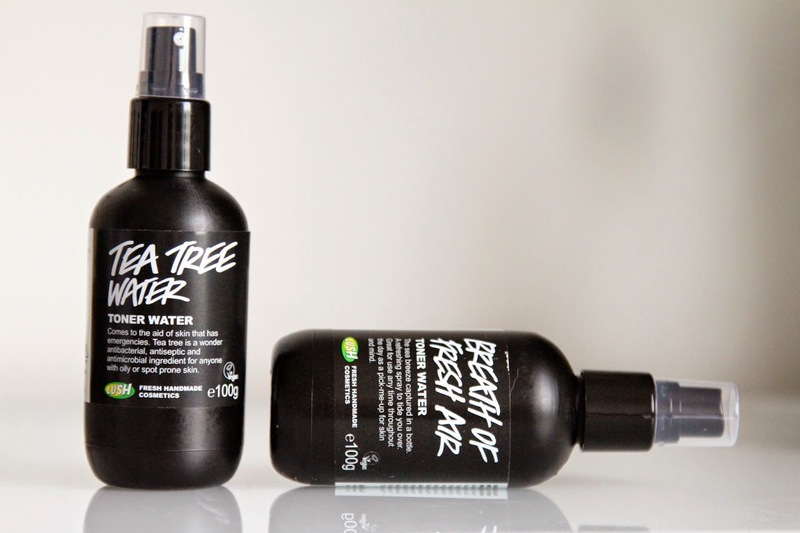 First of all and probably the most blogged about Lush product I own, is the Tea Tree Water Toner. I think I’ve mentioned this three times already… Yep here, here, and here. It’s basically a Tea Tree infused water that helps stop blemishes and redness across the skin. This is one of those ‘actually works’ products for my skin type and I highly recommend anyone who struggles with the odd blemish. Just a few sprays every morning, and your face is instantly hydrated and protected for the day! Next up is a similar product, the Breath of Fresh Air Toner. This is perfect for those days you’re feeling down in the dumps and your skin needs a little TLC. Instantly hydrating and instantly refreshing! Containing rose water to to sooth and calm, and seaweed to nourish and protect your skin, this is an all in one life saviour. Especially for those hungover mornings. Again, just a few sprays across your face and that’s all you need. When it comes to face masks, anything green and thick I love. I love the traditional face mask made with rich earth, seeds and natural goodness! The Mask of Magnaminty has exactly that, including Vanilla, Peppermint Oil, Marigold Oil and Primrose Seeds. I always use this at least once a week as it’s gentle on the skin yet effective when it comes to cleansing and removing impurities. It smells divine and leaves you feeling soft and fresh. Moving on, we have another favourite of mine which coming to think of it, I’ve never actually mentioned on gianniC. The Helping Hands Hand Cream. This is a soft and light hand moisturiser that I use across my cuticles. As my part time job is a waiter, I’m constantly washing my hands leaving them dry a lot of the time. This is what I use to instantly fix them. It absorbs into my skin straight away leaving no gewy sticky mess like some do, and is perfect for giving your nails that healthy shine. Finally we move onto a Christmas Special, the Snow Fairy Shower Gel. Now this isn’t an old favourite as it’s the first time I’ve tried it this year. Boys don’t be put off by the pinkness of this, because it smells amazing and leaves your skin feeling so so soft. That is it for my Lush Restock products. Let me know what yours are?